The deaths were not about religion, but about politics. About power. And the House of Saud's increasingly tenuous grasp on it. JANUARY 4, 2002. Three gay men were beheaded on New Year's day by the United State's Middle Eastern oil ally, Saudi Arabia. A little blood, a little circus, a flip or two of the red cape serve to keep the Islamist mob bullish on killing queers and not the royal family. Like the Christians thrown to the lions by the fading Romans, the deaths of Ali bin Hatan bin Saad, Muhammad bin Suleiman bin Muhammad and Muhammad bin Khalil bin Abdullah were not about religion, but about politics. About power. And the House of Saud's increasingly tenuous grasp on it. If the deepening financial crisis and growing awareness of the royal family's corrupt mismanagement of the country's resources weren't enough, the House of Saud's lip service to the U.S. war against terrorism has inspired a storm of criticism from Muslim clerics. Having railed against the presence of American troops on the Arabian peninsula for a decade since the Gulf War, many clerics, including the influential Sheik Hammoud bin Uqla al-Shuaybi, former head of the department of theology at Imam Muhammad bin Saud University, issued edicts post-September 11 declaring that "whoever supports and backs the infidels against Muslims is considered an infidel." U.S. support for Israel feeds the fire. 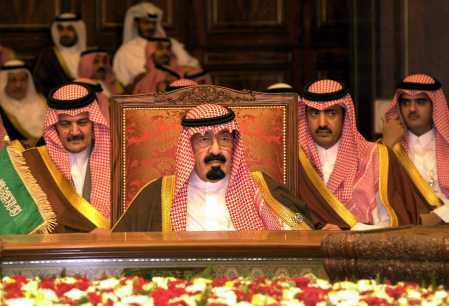 While the House of Saud has the throne, the clerics have religious authority and the courts. Since the eighteenth century, each has reinforced the legitimacy of the other. The clerics were particularly encouraged to support the royal family by the oil profits flowing into judicial salaries, mosques, schools, and courts. As the funds dry up (due to the drop in oil prices and output, the Kingdom expects a deficit of $12 billion this year), so does the carrot of support for the Sauds. That leaves the stick, unless the royals can prove their legitimacy and orthodoxy in other ways, maybe by tolerating, if not encouraging, the murder of queers. After all, the social distraction of queer-baiting has been used to great effect historically, from Franco's Spain and Castro's Cuba, to more recently, Egypt and Zimbabwe, and the Christian Right's U.S. Who cares about poverty or political instability, when you can incarcerate a queer, firebomb a gay bar, or electroshock a lesbian? The stakes are higher for the scapegoats in Muslim countries like Saudi Arabia, where social control is a blood sport. According to Amnesty International, Islamic courts there ordered at least 34 amputations during 2000. Floggings of thousands of lashes were imposed for a huge range of offenses. There were 123 known executions. Queers aren't the only targets. Of the 123 killed, most of them  71  were foreign workers from India, Pakistan, Nigeria, Philippines, Yemen, Sudan, Eritrea, Ethiopia, Iraq, Egypt, Bangladesh, Syria, Afghanistan, Indonesia and Thailand. So, while one-quarter of Saudi Arabia's population is foreign, they account for 58 percent of those who were executed. Furthermore, many of these were sentenced to death for offenses without lethal consequences like robbery, homosexuality, apostasy, and sorcery. Late New Year's Eve, shortly before Ali bin Hatan bin Saad, Muhammad bin Suleiman bin Muhammad, and Muhammad bin Khalil bin Abdullah were beheaded, Saudi Arabia and Iran issued a joint statement condemning the Western media for what they felt was a campaign against Islam and pledging to make it known that their religion stands for peace and justice. For "Three beheaded for homosexuality," in Arab News, "Saudi Arabia's first English language daily." For Amnesty International Press Release Re: Saudi Executions including Action Alert posted at Al-Fatiha news. For the Embassy of Saudi Arabia in Washington, D.C., check out www.saudiembassy.net , call Tel: 202-337-4076 or 202-337-4134, fax: 202-944-5983 or email: Info@saudiembassy.net. For Amnesty International's 2001 Report on Saudi Arabia covering events from January - December 2000. For how Saudi Arabia's Sexual Apartheid is enforced by U.S. companies. For Holy War Lured Saudis as Rulers Looked Away. For IGLHRC (International Gay and Lesbian Human Rights Commission). The Gully's ultragay coverage. Includes musings on activism, info on queers from Puerto Rico to Taiwan and more. From global warming to gay-trendsetting. Includes headlines, politics, and news from beyond. News, opinion, politics from Algeria to Zimbabwe. Including homophobia in Southern Africa and the colonial legacy everywhere. Guide to the Sept. 11, 2001 terrorist attacks on NYC and DC. Includes info on Afghanistan and the Taliban. � The Gully, 2002. All rights reserved.